It has been long that the General Motors engineers are presenting their powerful crossover SUVs in market. 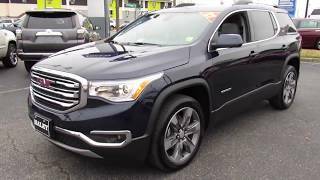 In lieu to same they recently shared the GMC Acadia 2017. Carrying new design theme inside and out, the model is loaded with new powertrain options. 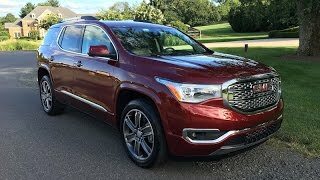 Let us have a look at the review of GMC Acadia 2017 to know in detail about it. The interior of GMC Acadia 2017 carries an entirely new design. Let us begin with the tech upgrades; there is an eight-inch Intellilink infotainment screen over the elegant and well arranged dashboard. Beside it, is the newly designed three-spoke steering wheel while the instrument cluster is a digital gauge in form of a full color TFT display, which includes analog speedometer, coolant temperature and fuel gauge. Moving towards the rear occupancy we have a three-person bench and an option to replace it by two captain chairs. Company also made moving to the third row easier. Getting back to the technology, the infotainment system supports Apple CarPlay and Android Auto both with 4G LTE Wi-Fi hotspot that enhances your experience inside the model. 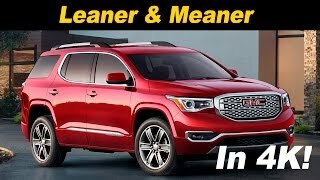 Thus rounding up the interior details of GMC Acadia 2017, I would say it is luxurious, comfortable and spacious, and tech loaded. Just like the interior, exterior of GMC Acadia 2017 is way too attractive. Starting with the front fascia it has unique three-bar grille featuring black chrome trim. The wide elongated headlamps look gorgeous while the lower section has a set of fog lamps on both side and the center portion being dedicated to the black-chrome worked air vent. Moving towards the rear portion you’ll notice the massive 20” wheels. However company has also provided an option to go with 17” and 18” wheels. The rear end has wide tail lights. The entire look feature the model’s off road capabilities in a mesmerizing way. 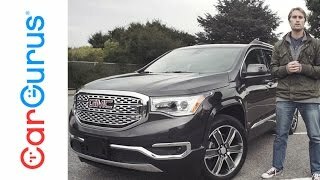 Together the exterior details of GMC Acadia 2017 has everything that can steal the gleam while rolling down the lane. Beneath the hood of GMC Acadia 2017 will be two powertrain options. The standard engine is a 2.5 liter four-cylinder fuel efficient engine while the optional pack is a 3.6 liter V6 engine cranking 310 hp. 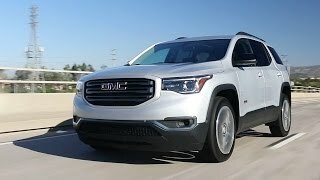 The output figure of former variant are still not revealed and nor are the performance figures of GMC Acadia 2017 shared till date. We assure to bring them to your doorstep as soon as company unwraps the details.